Did you know you can train a fish? It’s true! Like our marine mammals, many fish at the Aquarium have been trained to target, touching a body part, like their snout, to a particular object. Targeting helps lead animals to where we want or orientate them to a specific area. 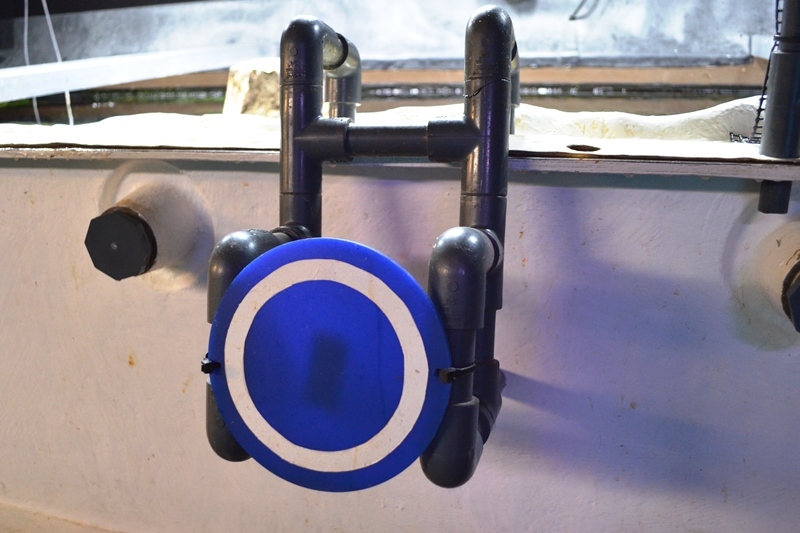 For fish, a lot of targeting behaviors center around feeding. And one of these well-trained fish lives on the Aquarium’s second floor! The Asian arowana, aka dragonfish, is a beautiful red and gold-colored fish located in our Ancient Fishes exhibit. With lots of animals in this exhibit, it’s important to know that everyone has a chance to eat. Fortunately, our arowana has a “fin up” on the competition — he’s target trained! Having traveled from the Toledo Zoo many years ago, it’s an old pro at this behavior by now. By associating one particular object with food, the arowana will swim over and get something to eat when it spots that object. 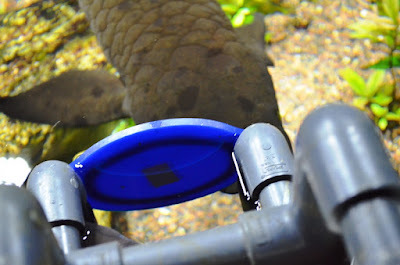 To start the feeding process, a large blue and white circle is lowered and hung off the side of the exhibit. This highly contrasted color combination helps the arowana see it against the background of the exhibit. Once the target is located by the arowana, it knows that it’s time to eat. The fish will swim over to the target, touch its snout to the circle (or at least get close), and then is quickly rewarded with a shrimp or small fish. Just as the arowana learned how to target, there are some others that have figured it out! It’s not the only fish that swims over when the target goes in the water. A couple of exhibit-mates, including a lung fish, can be seen hanging around trying to steal a morsel. But the aquarists are careful to try and feed only the arowana with this target, ensuring that gets its particular food selection. This type of feeding might seem like a lot of work for one fish. However, it’s really important for the overall health of the exhibit. 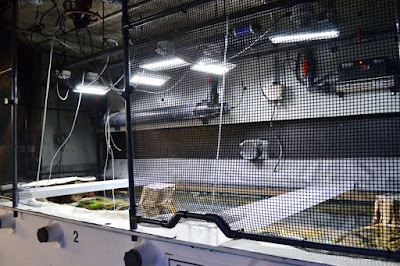 It ensures that the arowana gets enough food specifically for it and allows the aquarist to get a good close at how it’s doing. 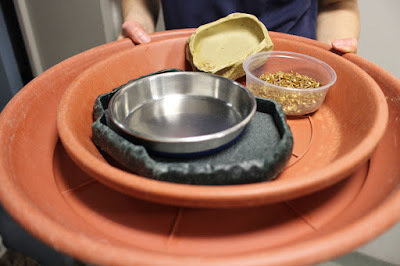 Target feeding also helps alleviate competition during feedings. 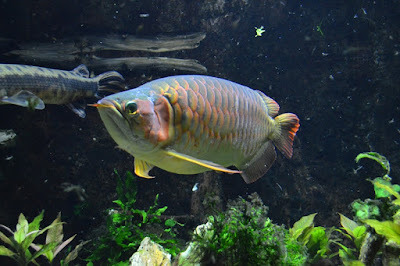 The arowana is a fast fishy predator, while some other fish on exhibit are a bit slower. By feeding the fish in this way, arowana only associates the target with food. No target = no food for the arowana and let’s the other animals have a chance to eat. It’s such a successful feeding strategy that we do this with other animals at the Aquarium, including sea turtles and different fish species in the Giant Ocean Tank! Feeding and getting footage is tricky! 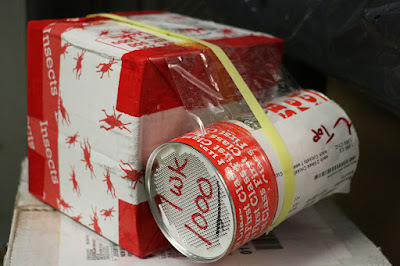 To see the target feeding from a visitor’s point of view, check out the video below! You’ll be able to see the arowana swim up to the blue circle. 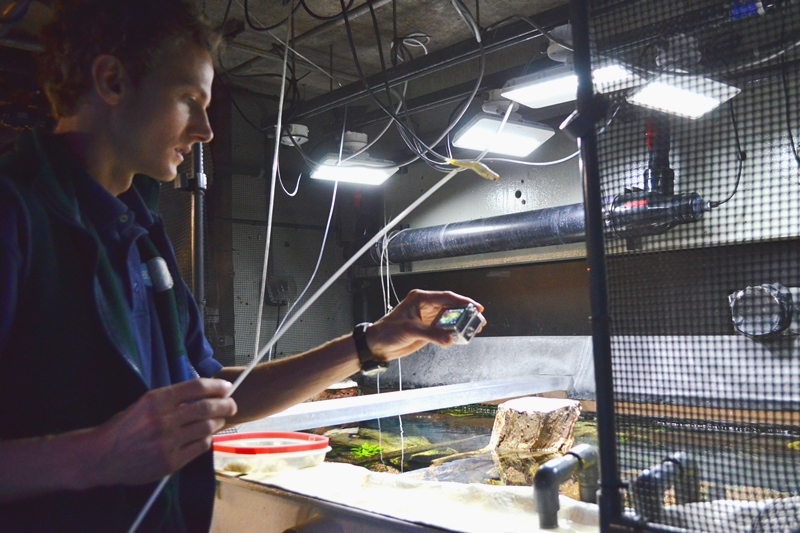 Once it swims close, Jeremy, one of our head aquarists, quickly lowers in a fish or shrimp and then it’s snack time! Next time you come in to visit, check out the Ancient Fishes exhibit and our extraordinary Asian arowana. If you see a blue circle in the exhibit, it may mean lunch isn’t too far behind. 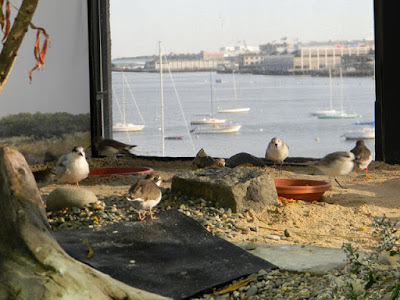 The shorebirds exhibit at the Aquarium is a quiet, sunny oasis for the rescued birds that live there. Watching them bop up and down the exhibit's shoreline, listening to them cheep and squawk, is also a treat for visitors. 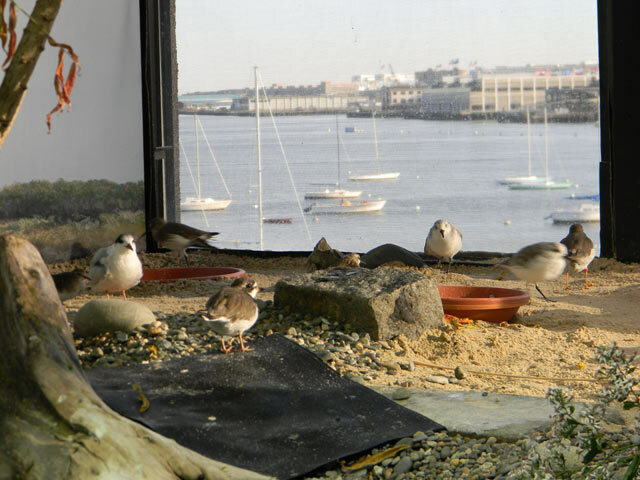 The shorebirds get the corner office with a view of Boston Harbor. But mealtime might make some folks squirm. This day, our aquarists fed the birds a tasty buffet of beetle larvae, served up in trays and distributed discretely around the exhibit. The trays keep the larvae from wriggling into the sand and pebbles in the exhibit. The fish-eating birds — the common terns and black skimmer — also dine on frozen (then thawed) silversides and capelin, which are also on the menu for other Aquarium animals like the penguins and large fish in the Giant Ocean Tank. And no, they don't actually eat the fish in the exhibit! And now and then, the aquarists also release a jar of crickets into the exhibit. That's when you can really see the birds forage! In the wild shorebirds rely heavily on bugs and crustaceans they find on the beach, mainly in the wrack, or seaweed, that washes up and is found along the high tide line. In our exhibit, however, it would be a lot of work to constantly haul 50 pounds of wrack into the everyday and we might not know how much the birds are eating. Most of the shorebirds in the exhibit were injured and could not survive on their own in the wild. There are the common terns, Ike and Truro, the semipalmated sandpiper, and piping plover. On your next visit to the Aquarium, be sure to take a moment to watch the shorebirds in their exhibit—you'll be transported to warm summer days at the shore no matter what the weather is like outside.